At least 1 hour before grilling, soak wood chips in enough water to cover. Drain before using. In charcoal grill with a cover, place preheated coals around a drip pan for medium indirect heat. Add ½-inch hot water to drip pan. Sprinkle half of the drained wood chips over the coals. Place ribs, bone side down, on grill rack over drip pan. 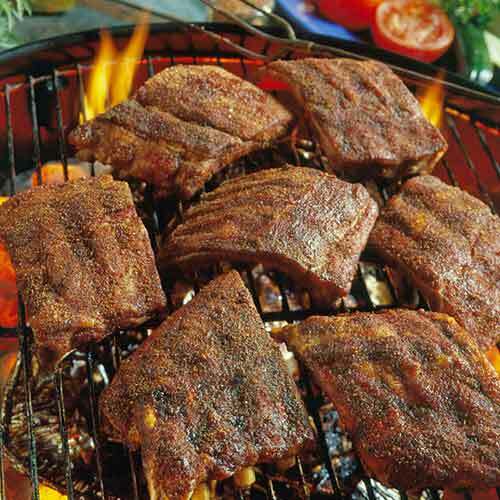 Cover and grill for 1½ to 2 hours or until ribs are tender. Add more preheated coals (use a hibachi or a metal chimney starter to preheat coals) and wood chips; turn ribs halfway through grilling. Note: For gas grills, preheat and then turn off any burners directly below where the food will go. The heat circulates inside the grill, so turning the food is not necessary.